A lot of disturbing images circulated the internet following the devastating building collapse that killed nearly 1,200 garment workers in Bangladesh last April, but none are more haunting than a series shot by AP Photographer Kevin Frayer. Many workers only survived the tragedy because non-medical staff sawed off their limbs to free them from fallen rubble – without using any kind of anesthesia to numb the pain. As we move past the momentum of the international outcry following the Rana Plaza’s collapse, these images serve as a painful reminder of the sacrifice Bangladeshi workers have made to satisfy our unquenchable desire for fast fashion. A lot of disturbing images circulated the internet following the devastating building collapse that killed nearly 1,200 garment workers in Bangladesh last April, but none are more haunting than a series shot by AP Photographer Kevin Frayer. Many workers only survived the tragedy because non-medical staff sawed off their limbs to free them from fallen rubble - without using any kind of anesthesia to numb the pain. 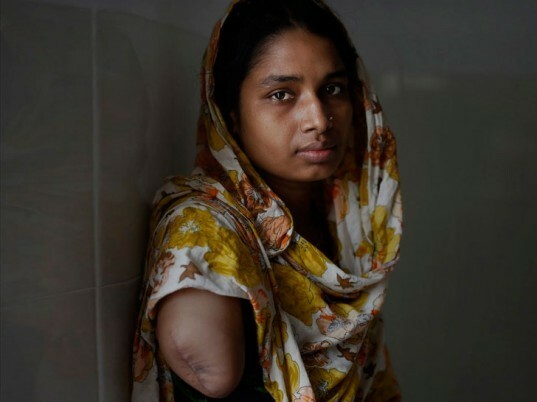 As we move past the momentum of the international outcry following the Rana Plaza's collapse, these images serve as a painful reminder of the sacrifice Bangladeshi workers have made to satisfy our unquenchable desire for fast fashion.